The Settings page of the Linksys Cloud Manager allows you to configure the settings of the entire network that you have selected. To get to the Settings page, log in to the Linksys Cloud Manager. Select the name of your network then click on Settings. NOTE: Before making any changes, make sure you have selected the correct network by checking the top-left section. This section allows you to configure the general settings of your network. Icon – Displays your network icon. You can click on Edit to change the icon. Name – Displays your network name. You can click on Edit to change the name of your network. Note – Click on Edit to add notes for the network. Delete network – Click on the Delete button to permanently delete a network. NOTE: Click Save after changes are made. 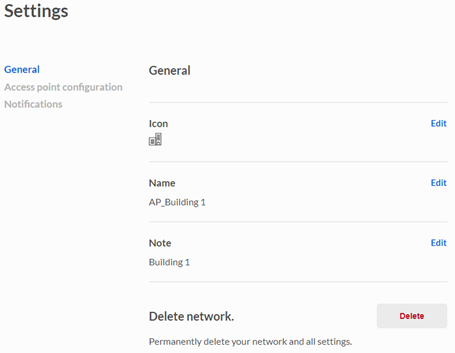 This section allows you to configure specific settings for all access point within the network. IMPORTANT: Any changes made in this section will be applied to all access points within the selected network. If you want to configure a specific access point, go to the Access Points page > select an access point > click on the More tab. Time zone – Configure your time zone for all access points associated in the network. 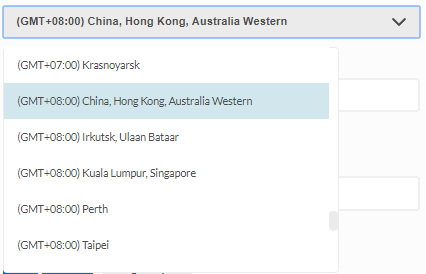 From the drop-down menu, select your Time zone. Configure the NTP Server 1 and the NTP Server 2. 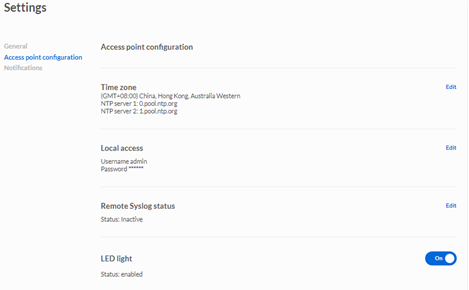 Local access – Configure your local admin password for your access points. ​​NOTE: The default username and password is admin. Enter your new Password. You can also add an optional password hint. Remote Syslog status – Send logs to the Syslog server. From the drop-down menu, select Active. Enter your client’s IP address on the field. LED light – Toggle the switch to enable or disable the access point's light indicator. This section allows you enable email notifications when an access point goes offline. To do this, follow the steps below. Tick the Send an email radio button. 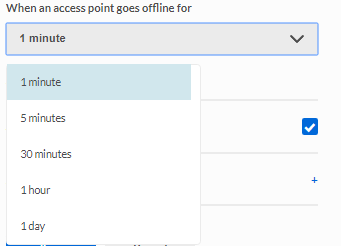 From the drop-down menu, choose a time interval for the notification to be sent when the access point goes offline. You can send an email notification to all network members or to specific people only. To send an email to specific people, uncheck All network members. Click Add people then enter an Email address.